I recommend that every SAK enthusiast have a Wenger plier used on the 130mm category. It is a very interesting design that gives much knowledge. It is a precision mechanical device that only the best can make. 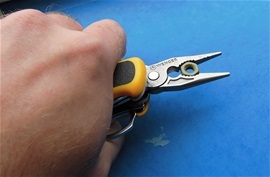 On the picture today you can see some maintenance tips for this plier. If you clean it then I recommend holding the whole SAK under warm water and use a toothbrush or a brush to clean dirt and substances. If you use some mild soap like I do then rinse very well. Use softer brushes or medium brush devices inside the mechanism and on every place you can reach. It is important that after the tool is clean and dry that you apply some oil. I use the Victorinox multi-tool oil always. Some use sewing machine oil or mineral oils. I recommend food safe oils because this is a safety for food work if you need it. 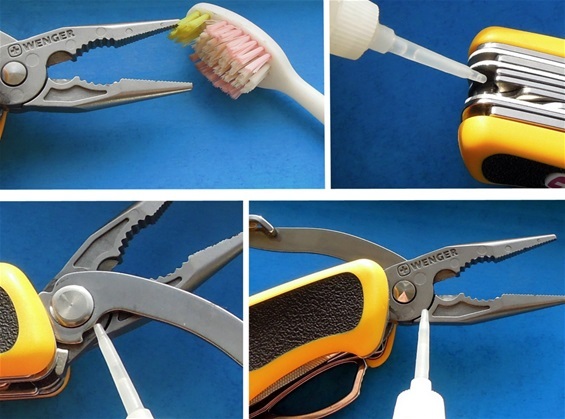 It would be difficult for the oil used on the plier to not reach the other functions. This is also some of the idea on SAKs that the oil will distribute. Remember to use the brush well inside the plier because this is the area that usually gets extra dirty and if you do not clean then some corrosion may happen. If the griping sections of the plier get dirty and with corrosion then the grip function may become slippery. It is no need for much oil on the grip sections because it may become slippery when you hold a device. Just oil it and wipe off! It is important to have some oil on is the lever arm and the plier jaw rivet construction. On the picture you can see the places you need oil. When you close the plier the lever arm will be possible to reach better and to clean. Then oil. I do not let the plier hold in this position more than a few seconds to reach. Then on the picture to the bottom right I put some oil for the important mechanical function and remember to do this on both sides! Then move the level arm up and down in open position so the jaws move up and down. Use two drops of oil on both sides because this will secure oil distributing inside the construction reaching the rivet and lever arm as well. How warm water? answer is no warmer than you can hold the hands without gloves under the water comfortably! It can be smart from time to time to put a drop of oil on the mechanics and the places for oil. If you feel that some dirt or substances has built inside between the plier jaws and rivet preventing the proper mechanic functionality then you can use some WD-40. This you can do when or if warm water and cleaning cannot release it. Let this work for some hours before cleaning it. If you have dirt and substances that prevents the functionality then hold the plier in open mode and move the lever arm up and down. The jaws will move up and down and the water will release it. Do the same under flowing water as well. When you after this when dry use some multi-tool oil or food safe oil this will also help release some. It is an advantage to carry a tool in a pouch or in a pocket so dirt will not get into the SAK. Do not drop it in sand. If you use it in the outdoors make sure you rest it at a place without dirt, sand and substances. It is not dangerous for it is just what the best is and it will give the best functionality. It is not fun if the lever arm will not move the jaws up and down. In pretty much 100% of the cases when a plier is not functional then it is because of no maintenance and oil. This is the key for any tool in the world. After cleaning the SAK under water some may experience that when dry that a layer of oil or remains of it are distributed all over the SAK. This is why I use some mild soapy water two times and rinse a long time and moving all the functions open and closed. If you have that oil layer then use a cloth and clean wipe off every place. Then clean again. Sand, corrosion and substances are not good for the mechanism. In some cases it can be dangerous for it but this is obvious. When the plier is completely stuck or it is very hard to use then you can damage the plier if too much force is applied. Put some WD-40 on and let it work for some hours and take step by step action. It is important that there is at least some oil on the mechanism if you do not like maintenance. This will prevent corrosion and substance that can get a hold on the steel and metal and slowly disrupt the surface thus preventing functionality. Remember that it is only one part of the jaw that moves and give the different gaps in open mode and using the lever arm. It is important on any plier or multi-tool that you put some oil on both sides like i have explained, this is to secure distribution of oil to all the parts mentioned. Remember that it is important that the springs get oil so the tang of the other part of the jaw may move free in the slip joint mechanism. It is important not to forget the closing and opening of the plier construction. It is a very interesting design with many moving parts! Only one jaw is moving when you use the lever arm but the construction is an advanched mechanism and the other jaw is moving when you open and close the complete mechanism. It is a very different design than you find on traditional multi-tools. using the lever arm you will see this spring move up and down! There is a kind of locking mechanism on the plier in open mode when the two jaws are pressed together fully or when using a very narrow gap. The mechanism on this plier is advanced and consists of a spring loaded plier with springs for a slip joint mechanism and support spring. When the plier is folded out and the jaws are together then you should never press the plier into the body of the knife. Use the lever arm and fold that in first. You can see that the jaws are open when doing so. Just fold the lever arm completely in that is the correct way. When you have the plier folded out and using it then the support and spring mechanism will hold the plier out and with the counter weigh and pressure you apply on the lever arm. I hope I make sense because it is not easy to explain. It is not much maintenance needed for this construction and plier, just from time to time really. It is an advanced mechanism that consists of many moving parts and it is wonderful! Use the plier in any direction you want, up or down no matter. 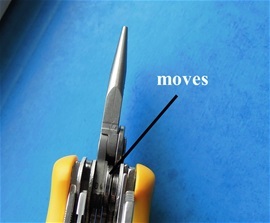 It is supported enough preventing the plier head to fold during use. With some maintenace from time to time then you will have one of the most advanched plier mechanisms in the world. when you are locked onto a device then the plier head is locked hard and supported with your hand and the mechanism into one entity than cannot fold in, this is pretty cool! Do not press the plier jaws together when folding the plier into the body of the knife. Let the jaws be free and use the lever arm! One of the factors that SAKs are known for is the precision and clockwork functionality. If people forget about maintenance then you do not have precision and clockwork functionality. The SAK talks with the sounds it make when closing and opening the functions. This talking can also momentarily give a hint to lack of oil and dirt or substances in the way. I can by the sound it makes like a fine mechanic can listen to an engine hear what is going on with the SAK. I can determine the spring pressure together with the feel in my hand. This most SAK enthusiast and knife people can do too. We can determine a hard used or a well-used SAK by the talk and feel. Remember that maintenance and proper use is the key for the durability on the knives. The mechanism and precision in this Plier gives a new meaning to advanched!